The forgotten naturally aspirated 3-litre Soarer. In addition to the variety of engines, Soarers are available in a bewildering range of models and trim levels. There are cars with TVs, four-wheel steering, air suspension, CD changers, leather - the works. However the 3-litre Soarer that we have on test this time is relatively bare-bones - if any luxury two-door can be called that! But inside you'll still find acres of cowhide (a brand new re-trim in the case of this particular car), digital dash, climate control, tilt & slide glass sunroof - and power steer, windows and mirrors. However, no matter how hard you look, you won't be able to spot cruise control, a trip computer or any airbags. Open the long and heavy door of this big personal coupe and the interior is an airy and inviting place. The high waistline and laid-back front and rear glass don't impose too much of a space penalty (in the front seats at least - the back's another story), while the multi-adjustable seats (including electric lumbar) and height- and reach-adjustable steering allow a comfortable driving position to be easily found. But the high centre console (you reach up for the auto shift rather than down for it) and distant exterior dimensions immediately make you realise that this is quite a large car. And even the excellent turning circle doesn't really diminish that feeling. 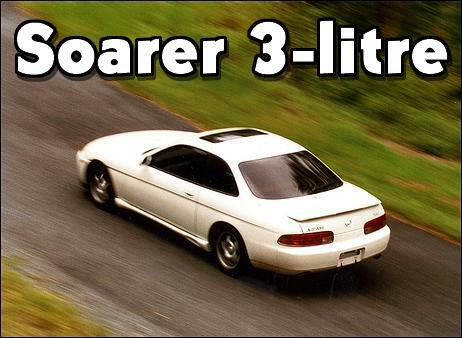 The Soarer is sold in some markets as a Lexus, and the engineering is obviously up to that high standard. The engine - interestingly still using a single coil and distributor - develops excellent torque and, after all, 168kW isn't exactly a trivial amount of power - even in a car weighing just under 1600kg. In fact, in the wet conditions that prevailed during our test period, there was enough low-down grunt available to make it easy to light up a single rear wheel - no LSD or traction control is fitted to this model. For a 3-litre engine, both the intake and exhaust systems of the 2JZ are large. On the intake there's no airflow meter getting in the way of inhalations (MAP sensing is used instead) while the exhaust manifolds (featuring dual oxygen sensors) flow into a twin system, with a pipe exiting at each side of the rear of the car. Although the exhaust on the car we drove looked quite standard, the raunchy note produced as the high-stepping DOHC six wound its way up through to the 6500 rpm redline was quite seductive. That's not to say it was loud inside the car - as you'd expect, the car is very quiet - but during some of our country road photography, the distinctly sporting note could be recognized in the still conditions from hundreds of metres away. The auto trans is set up more for smooth changes than aggressive jerks, with the ratios slurring through on full-throttle changes. However, the trans can be galvanised into a sportier mode if the console button is switched from Normal to Power. Unlike some similarly-labelled systems, the Soarer will still select its tall overdrive fourth gear while in Power mode, but its new-found ability to swiftly pick up (and then hold) lower gears makes the car come alive. In addition, the lever can be manually moved back to second gear without operating the detent, and fourth can be switched in and out with another button. The multitude of transmission options really does take away a lot of the need for a manual trans - with this auto, even engine braking can be easily and smoothly carried out, the evident high compression of the engine aiding in this area. The relatively low gearing - at an indicated 100 km/h the engine is spinning at 2600 rpm - also helps gives immediate throttle response, even in overdrive. The ride is a mixed bag. Wearing 225/55 Falken FK-05GR tyres, the test Soarer - while never unsettled on its suspension - had a more jiggly ride than expected, while over larger amplitude bumps the damping showed softness. Unfortunately, it was a combination that made me feel carsick, something that I last complained about way back when we tested a Citroen Xsara. The tyres also weren't a good match for the steering, giving a slight nervousness at the straight-ahead position when travelling in freeway conditions. However, the cornering grip levels and composure across difficult bitumen were both fine - as you'd expect, the sophisticated wishbone suspension coping well with directional changes. Vented discs are used front and rear, and these combine with ABS and a light pedal to provide very secure deceleration performance. The well-integrated cabin controls work well, with the digital climate control system delightfully simple to use. Unlike systems fitted to, say, contemporary Nissans, the function of each control is largely self-explanatory - there's no confusing 'logic' that you need to learn first! Wiper and light controls are on Japanese generic stalks, while the digital instruments are clear and readable, at least in the overcast conditions that prevailed. The sound system fitted to the test car comprised a factory radio cassette deck working through six speakers. Unlike the system available in some Soarers which features a rear deck-mounted subwoofer, the JZZ31's system wasn't outstanding - just competent. This car was also fitted with a changeover switch that broadened the range of radio frequencies able to be received to match the wider Australian spectrum. Soarers - all of 'em including the V8 and turbo models - are available anywhere from $20,000 to $40,000, with age, condition and kilometres dictating prices more than any other factors. The pictured 1995 car was for sale at $32,000 and presented very well, with its brand new leather and as-new pearl white paint. With a measured 0-100 km/h time of 10.6 seconds the NA Soarer isn't in the same performance ballpark as its gruntier brothers, but the engine's response and torque mean that performance is seldom felt to be substandard. Fuel economy on test was about what you'd expect - 12.7 litres/100km. With a small boot and fairly tight rear seat room, the Soarer isn't the sort of car that could be easily pushed into a family carrying role. But with its ample power and luxury, excellent build quality and composure on the road, it's ideally suited to someone wanting a quality personal coupe different to the run of the mill. Thanks to Car Imports Australia of Queensland's Gold Coast, who provided the test Soarer.